I had an amazing wedding and was really happy with my dress, so thanks again for your hard work! 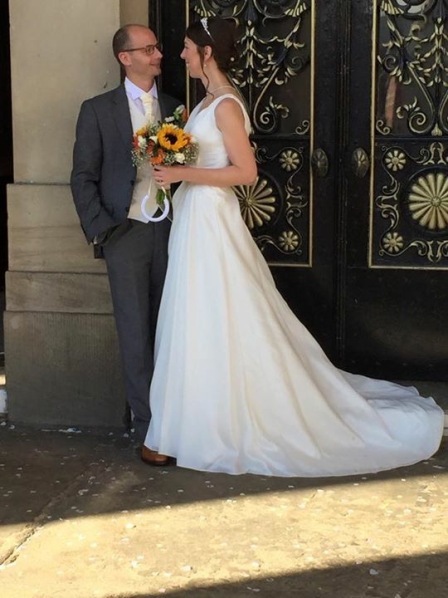 Just wanted to say a quick thank you following my wedding – everyone was very impressed with my dress. It was perfect! I would like to say a massive thank you to anne for all her hard work in making the alterations to my dress so it fit perfectly on the day. Everyone commented on how beautiful my dress was. I would highly recommend her to anyone looking for a wedding dress. I chose to get my bridesmaid dresses from Fairytales, who were recommended to me through a friend. The whole experience was a complete pleasure from start to finish. Every question I had ( and trust me there were many) was answered efficiently, which in my case was crucial as I left it a little late. 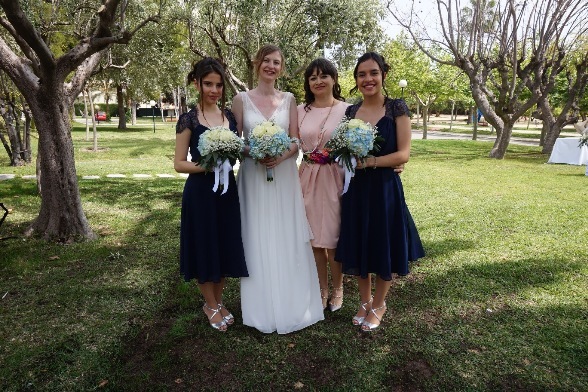 The alterations were immaculate and the advise the bridesmaids received, about transporting their dresses abroad and getting in and out of the dresses was fantastic. Fairytales gave me advise with the style and colour, pointing out through their experienced eyes things I would never have thought of. Even taking on a bridesmaid 9 months pregnant and the gamble of ordering and altering the right dress for the wedding 2 months later. The yellow dresses were perfect and really flattered them all. They were the perfect compliment to our sunny wedding in France. happy after 3 years of marriage. I just wanted to say a big thank you for all your help in the run up to our wedding. My dress looked fab and everyone loved it. Attached are a couple of pictures from the big day. 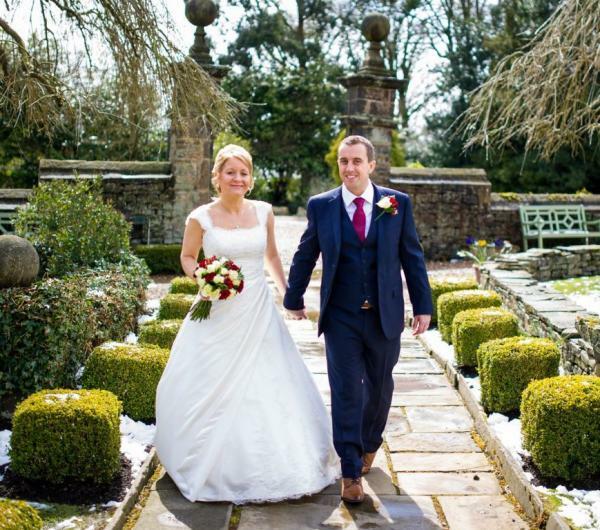 We had a lovely day on Saturday and thankfully the weather held. 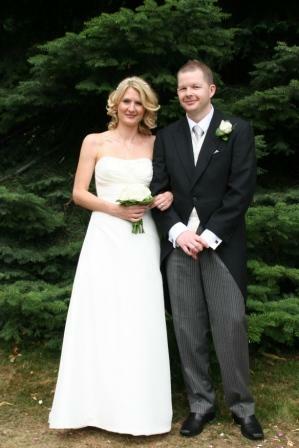 I was inundated with lovely comments regarding my dress so a big thank you to you! I would recommend Bridal Fairytales to any future bride looking for the perfect dress at outstanding prices which won't break the bank. The service was second to none and I was made to feel at ease from the first appointment. Thank you again with love and best wishes. Our wedding day was perfect! Everyone loved my dress. Our wedding car driver said it was THEE dress of the year! Was very proud and glad to hear that. Will be recommending you to friends of mine in the area. 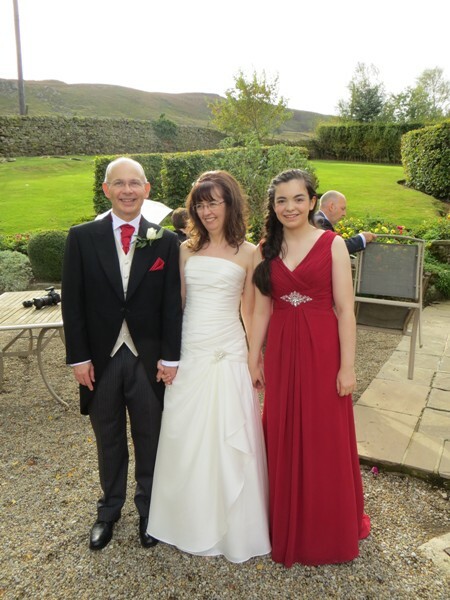 My dress was wonderful, travelled very well! Just wanted to drop you a quick note to thank you for your help in finding me the perfect wedding dress at such short notice. We had the most amazing day. Thank you so much. 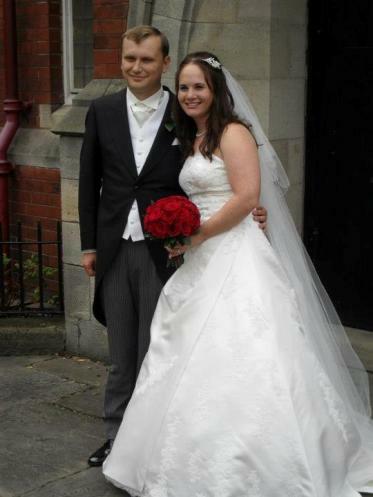 We had an amazing wedding day on Saturday 17th November 2012. Everyone commented on how lovely the dress was, I really do want to thank you so much for making buying a wedding dress an absolute delight. 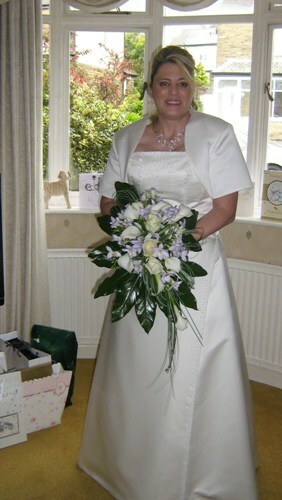 I was so happy with the finished product, I could not believe it when I had the final fitting it just looked gorgeous. 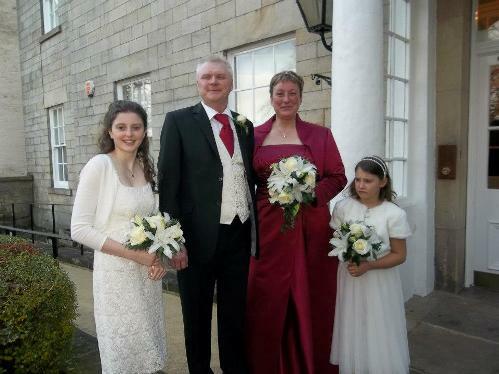 The colour cranberry was so appropriate for a winter wedding. Thank you Anne for making me feel like a princess. Thank you ever so much for all your help with the dress but I have decided to go with the other one which is sooo me & perfect in every way! Yours was beautiful and your service is great. I hope you are well. We had an amazing wedding and I have attached some pictures. Thank you very much for being an important part of my big day and having such a beautiful dress! 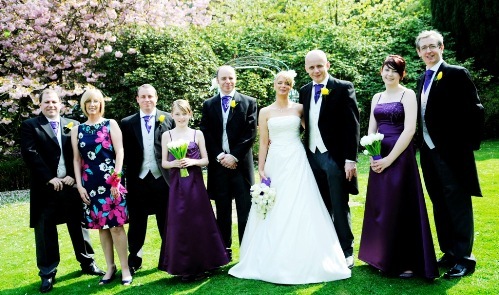 We would like to thank you for providing our suits and bridesmaid dresses for our wedding. 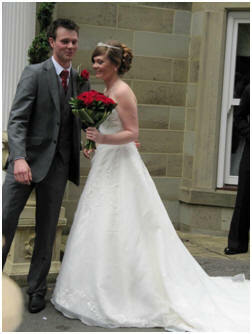 We were so happy with them and they al looked stunning on the day. 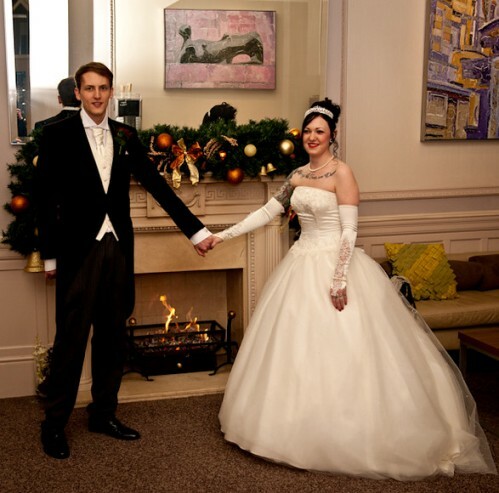 We have received so many positive comments from guests on how gorgeous they all looked. 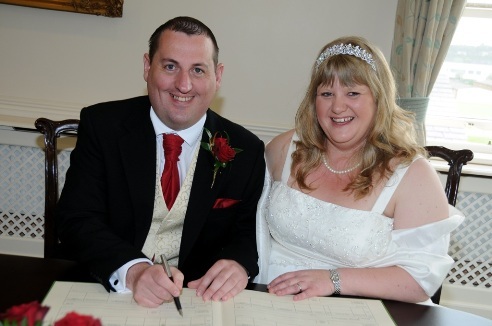 We have enclosed some photos taken on the day. Thank you so much, Anne, for helping in making our day so perfect. I would definitely recommend Fairytales. Anne was so friendly and warm and not at all salesy or pushy which I really appreciated. There is a wide range of beautiful dresses at really reasonable prices and Anne is so helpful and accommodating. It was such a great experience trying on the dresses. I found my dream dress and absolutely loved it and wouldn't have gone anywhere else. Thanks again for all your help - I absolutely loved the dress! I just wanted to thank you for providing us with all the outfits for our wedding, I felt beautiful in my dress and all the men looked very handsome. Hi Anne - thought you might like to see 'Maria' on the Big Day. She was much admired by everyone, as were the veil and tiara so thank you again! 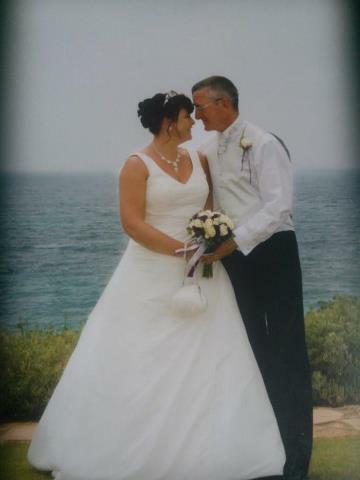 Just wanted to let you no how wonderful I felt in my wedding dress in Cyprus. 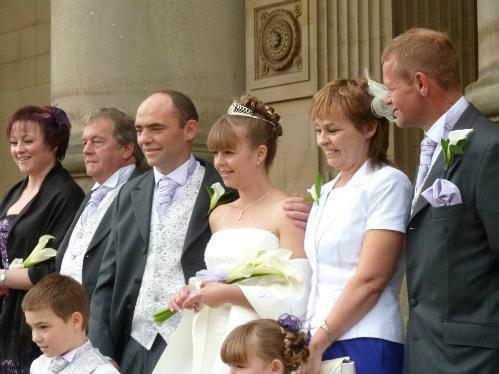 Everything was wonderful and it was immaculate when it arrived in Cyprus - all was perfect and I felt like a princess. Just to say thank you for a magical experience at Fairytales Bridal and how comfortable you make people feel at the most precious decision in choosing the dress of your dreams. It was lovely meeting you and I enjoyed coming from Manchester for my fitting. 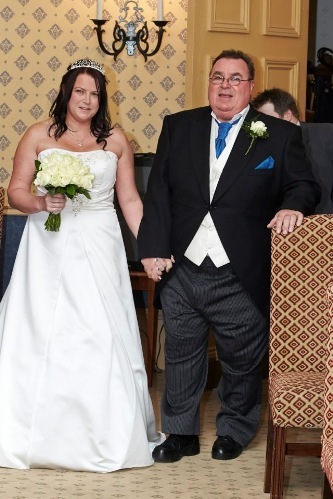 I have had so many comments on my dress and Rick was so shocked when I walked into the town hall as we had had a joke for the last year that it was strapless and with a big huge skirt. His expression when I walked in was amazing, He thought it was gorgeous and loved the bling at the top. Kind regards and thanking you again for everything. 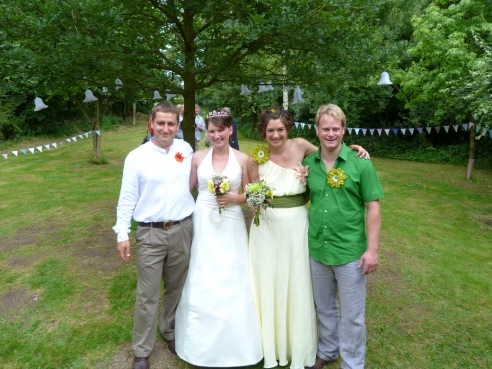 Sorry this is a bit late in coming but I thought you might like to see a photo of the double wedding at Fangfoss - Lynn wearing a dress from you (and Kate a petticoat!) They both looked gorgeous and we had a marvellous wedding weekend. 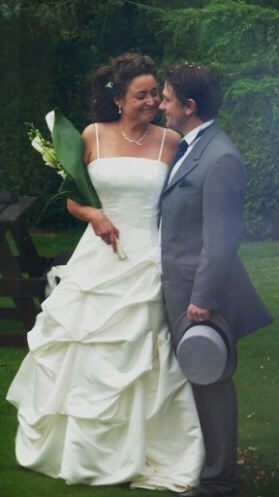 Thank you ever so much for all your help with picking the wedding dress. 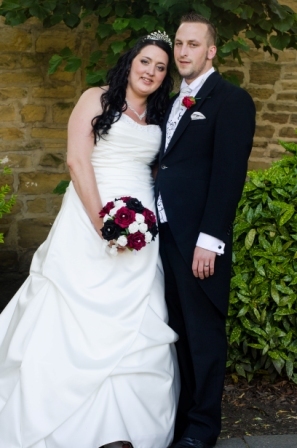 You were really nice and understanding and we would have struggled to choose a dress without your advice and suggestions. 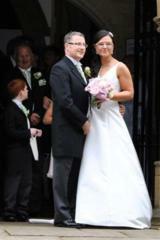 We had a fabulous day on 13th July and the dress looked great. All the guests really liked it. 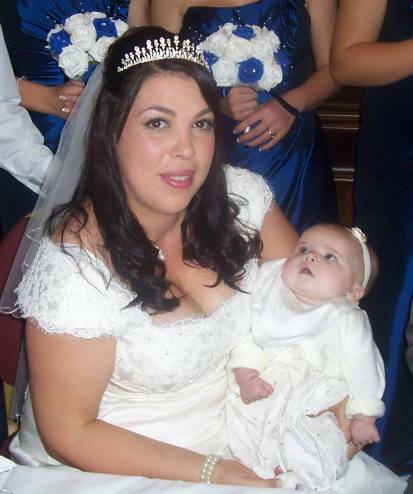 Would like to say a HUGE thank you to Anne at Fairytale Brides for being so patient with me and my dieting! As soon as I saw my dress I knew it was the one and fell in love with it straight away! It finally fit perfectly for my day after a few alterations and I felt every bit the princess! So thank you so much!!! Thank you so much for all your help and advice. You were not pushy at all when we came to view dresses and we had experienced some very pushy sales ladies!!! Katy knew the style of dress she wanted and when she put it on it was the wow factor!!! It was great to have a local shop that had a range of beautiful dresses at reasonable prices and all your alterations are included. She looked beautiful. Hello just wanted to thank you so much for my dress. Am so upset that I won't be able to wear it again! I do think your daughter should go for this dress - everyone loved it. I have tried to send you the front and the back of the dress I do hope you can get them. I would just like to share with you some of the photos of my gorgeous dress! 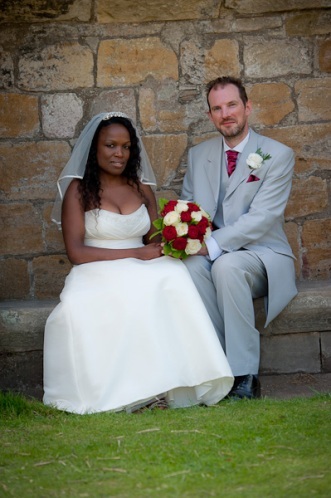 I would also like to thank you for all your help, advice and patience in the run up to my wedding.. I know Lou and I sometimes pushed your patience but it was worth it in the long run. Again many thanks for your help. Thank for all your help with the dress every one admired it and said how lovely I looked and how flattering it was. I had visited every major bridal shop within travelling distance of Leeds city centre, and tried on over 30 dresses. After being browbeaten by saleswomen - who were, quite clearly, only interested in getting me to buy a dress, without caring about what I actually wanted - it was such a joy to find someone who was willing to listen and not only came up with the perfect dress, but was endlessly patient in getting the adjustments just right - in a ridiculously short amount of time! Anne - you turned what had been a bit of an ordeal into an absolute pleasure. Can't recommend highly enough. Many thanks. 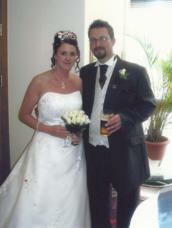 Thanks for all your help regarding our wedding suit and dress, they made our day very special. I have attached a photo. I just wanted to say a huge thank you for making a stressful task not stressful at all. You have been so kind and patient with fittings and the work you have done is amazing. I felt like a princess when I put the dress on. I would be happy to recommend you to any bride. We had an amazing day. Everything ran to plan. Thank you for a gorgeous dress. Everyone commented on how fabulous it was. I will be sure to recommend you to family and friends. Thank you. I had the most stress free and relaxing experience with Fairytales Bridal. The service was genuine and attentive and the products stunning and affordable. My experience from start to finish was faultless. I would highly recommend this company to any bride. I just wanted to write a quick message to let you know that I have decided to opt for a wedding dress from an alternative supplier, but also to say a huge thank you for your time. From my first appointment, you made me feel very welcome, and both the Joy and Martine dresses were gorgeous, making my decision very difficult- hence my second visit! I appreciated your advise/expertise and thought your approach was professional yet personal to me as an individual. Thank you once again and I wish you all the luck with your business in the future. I would just like to say, again, a huge thank you. My dress was absolutely beautiful and I have received many positive comments regarding it. I am so glad you suggested I try on different dresses than that I had in my minds eye; as soon as I tried this one on I knew it was 'the one'. 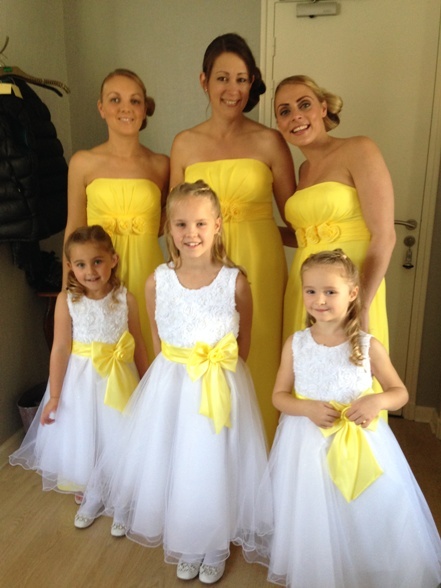 My bridesmaid dresses were beautiful too and the girls were thrilled with them. I have pleasure in attaching a photograph of the main wedding party; I think it shows both mine and the girls dresses in their glory. Thank you for all your help and support. Best wishes. 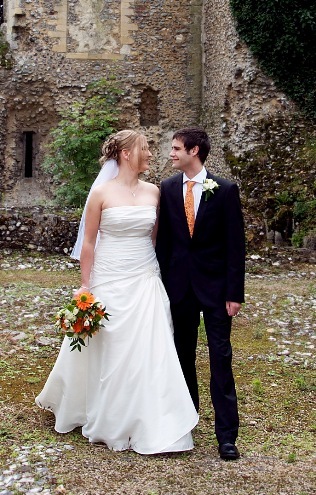 Just wanted to let you know that my wedding on the 26th September 2010 was lovely. 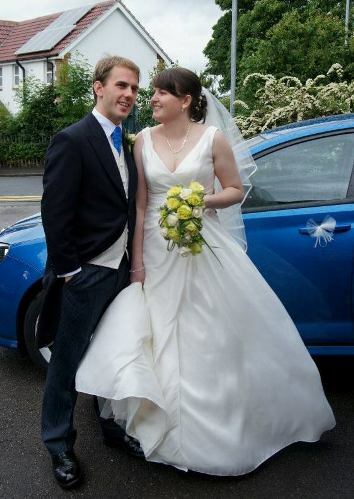 I adored my dress 'Pearl'. I felt like a princess all day and definitely chose the right one. Everyone commented on how lovely it was and how I looked and people thought it was a lot more expensive than it was. The bridesmaid dresses looked gorgeous too. I would like to thank Anne for all her hard work on my beautiful dress. I felt like an absolute princess on our big day! pleased with their outfits. I would recommend Anne to anyone, her service was fantastic!!! Thanks a million Anne for making help our day so perfect!! I have attached a few photos for you to have a look at. Just wanted to let you know that my wedding on the 26th September 2010 was lovely. 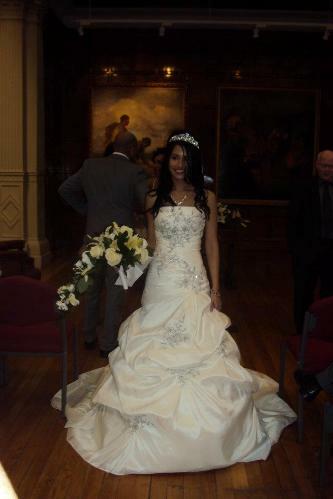 I adored my dress 'Pearl'. I felt like a princess all day and definitely chose the right one. Everyone commented on how lovely it was and how I looked and people thought it was a lot more expensive than it was. The bridesmaid dresses looked gorgeous too. I would like to thank Anne for all her hard work on my beautiful dress. I felt like an absolute princess on our big day! Not only did she have to alter my dress due to some last minute weight loss but she also had to alter all four bridesmaids dresses due to various reasons! And all the dresses were perfect. 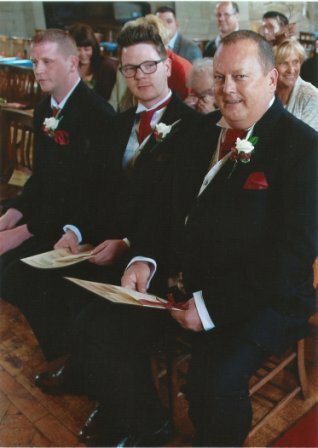 Anne also kitted out my husband and best man who were also really pleased with their outfits. I would recommend Anne to anyone, her service was fantastic!!! Thanks a million Anne for making help our day so perfect!! I found Fairytales on the internet. 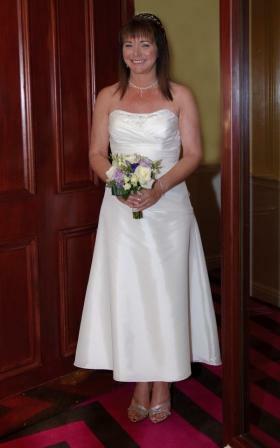 I had bought a wedding dress elsewhere but found it had a flaw and I didn't have much time left, so was very grateful that Anne could fit me in at such short notice. There was an awful lot of choice and all the dresses were beautiful and I had not seen anything else in the shops I liked any where near as much. I tried one particular one which was exactly what I had been looking for but had given up hope of finding. Other dresses I had seen were not as nice and twice the price at least! I felt like I looked amazing on the day. I would recommend anyone I knew to try Fairytales. Imagine a bridal boutique where you are always the only customer for a fantastic friendly one to one service. 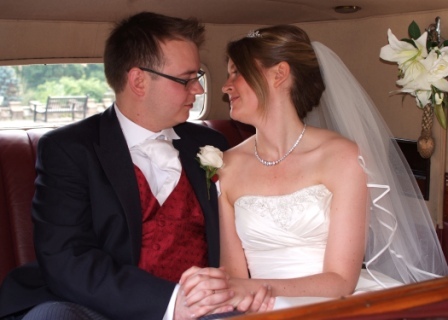 Where you know the price for your dress is not paying for the glitz and glam of the shop but instead you are welcomed into a homely atmosphere where the dresses are quality at real affordable prices and you have *Fairytales Bridal*. 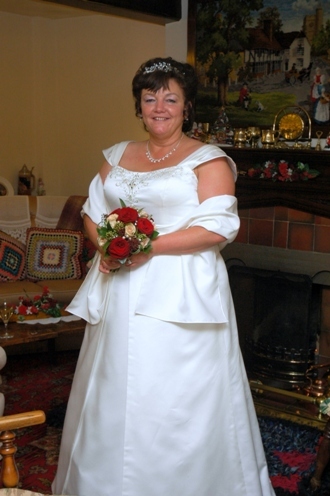 Anne is not pushy which is refreshing compared to other shops, and she even accommodated my dramatic weight loss without stress or heartache but best of all she is open evenings and weekends which is a fantastic help for the modern bride! 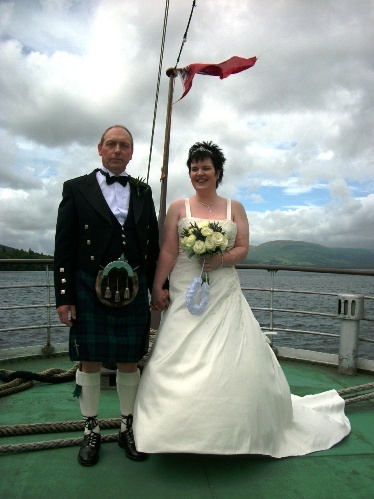 Everyone at my wedding agreed that my dress was fantastic - and thought I had spent a great deal more than I had! Thank you for helping me find the perfect dress. The dress fit perfectly and I was given lots of lovely compliments. I have already recommended you to a few people and will continue to do so.